This mansion, known at different times as Kingsbury Hall, Bloomsbury Court, and Woodlawn, is a landmark of rich historical interest. It was built by William Trent, in whose honor the settlement was named, on the tract of eight hundred acres which he had acquired from Mahlon Stacy, Jr., by deed dated August 17, 1714. Trent himself did not make his permanent residence here until 1721, but had built the house while still living in Philadelphia, coming here to enjoy it in the summer seasons before making it his permanent abode. As originally constructed the mansion was an oblong building erected of bricks brought over from Europe, and it exists today exactly as originally built except for a frame addition said to have been added about 1850 by James M. Redmond, the then owner. Chief Justice Trent died there on Christmas Day 1724. James Trent, his eldest son and heir-at-law, conveyed the property to William Morris, a merchant of the Island of Barbadoes, in the West Indies, by deed dated March 28, 1729. The deed conveyed three hundred acres of land “together with the brick messuage or dwelling house, lately erected by the said William Trent, wherein the said James Trent now liveth.” Morris held title to the property, conveying it to Governor George Thomas of Pennsylvania, in October, 1733. It is not known whether Governor Thomas ever actually occupied the house, but he held title until 1753.
. . . for which I give £60 per annum, our house is good and not one chimney in it smoked, and we live much more private here than at Morrisania. Your mother amuses herself with a brood of turkeys, fowels and ducks which she has about her. 1 Collections of the New Jersey Historical Society, Vol. IV, pp. 189, 205. 2 Pennsylvania Journal, August 31,1758. Whereas the subscriber having put himself at considerable charge in clearing the ground and laying out in lots of 60 feet front and 181 and a half feet back, being one quarter of an acre, to the best advantage of the settler, a most convenient piece of ground for a town lying in the county of Burlington and township of Nottingham, in West New Jersey, .being on Delaware River, at the ferry commonly known by the name of Trenferry, thence running as the road runs to the Grist Mill opposite; thence down the stream of the said mill to the River Delaware; thence down the river to the ferry; being the head of the navigation from the Capes of Delaware.
. . . it is accommodated with a genteel brick dwelling house, 40 x 48 feet, two stories high, four rooms on a floor, with a large handsome stair case and entry, with a cellar under the whole building, and a court yard on each front of the house, one fronting down the River Delaware to the ferry, thro’' a large handsome avenue of English cherry trees, the other fronting up the river to Trenton, with a large brick kitchen 30 x 20 feet, two stories high, with a well in it, and four handsome apartments above for servants . . . . The “brick kitchen” mentioned was built by Governor Thomas when Governor Morris became tenant, and has long since disappeared. John Cox, who purchased it from Dr. Bryant on October 28, 1778,changed the name of the mansion to “Bloomsbury Court.” He was an iron manufacturer at Batsto (in Burlington County). Mrs. Cox and their six daughters were very prominent in the social life of Trenton during their occupancy of Bloomsbury Court. They participated in the reception given to Washington at the Triumphal Arch by the Ladies of Trenton, when he passed here on his way to New York in 1789 to be inaugurated the first President of the United States. 3 A letter relative to this marker, written by Mrs. Worlock to the Rev. Mr. Armstrong, the minister of the church in 1792, may be found in Dr. Hall's History of the Presbyterian Church (revised ed. ), p. 211. Between 1795 and 1838, when James Redmond acquired the property, the mansion passed into the handsof William Cox, Sr., Edward Burd and Edward Shippen Burd, Daniel William Cox and Philemon Dickerson. The latter was governor of New Jersey from 1836 to 1837 and, as he owned the Trent House from August 1835 to September 1838, it was, most likely, the executive mansion during his governorship. Joseph Wood, a former mayor of Trenton, acquired the property from James M. Redmond in 1852, and, except as noted in the following paragraph, lived in it until his death on May 8, 1860. Mr. Wood conducted a general store at Ringoes before coming to Trenton. He acquired a very large amount of real estate after coming here, and at the time of his death was probably the wealthiest man in Trenton. His only daughter, Permelia Sargent, married Edward H. Stokes, and in August 1861 the executors of the estate of Joseph Wood conveyed the Trent House to Edward H. Stokes. The latter on March 17, 1887, conveyed it to his son Edward A. Stokes, the present owner, who vacated the building about a dozen years ago and has since resided at Morristown. The first public building to be erected in Trenton was the Hunterdon County Court House. It stood on the east side of Warren Street, midway between Front and State Streets, on the site occupied by the building recently vacated by the Trenton Banking Company. The lot on which it stood is commonly believed to have been given to the County of Hunterdon by William Trent. The Court House, a two-story building of grey sandstone with stuccoed front, 4 was built in 1719 and soon after its lower story was used for confining offenders of the law. 4 Raum gives a rather detailed description of the place in his History of Trenton. See also pp. 77-8, above. The court had sat alternately in Maidenhead and Hopewell townships from 1714 to 1719, pursuant to an ordinance of the seventh of April, XIII of Anne, which directed that the Court of Common Pleas and Quarter Sessions be held alternately at those places “until a court-house and gaol for the county should be built.” It having been represented to the governor that the then existent arrangement was inconvenient, the governor accordingly directed (March 1719) that the courts be held at Trenton from September on. The Court House was used as a jail probably as early as 1721. John Muirheid, the high sheriff, had complained to the court concerning the lack of a jail in 1714, 1717, June 1719 and again in March 1720. Escapes from the jail were frequent and the New Jersey Archives abound with notices of rewards by the jailor for the capture of escaped prisoners. In 1755 a group of Indians, who had been skulking about the countryside of Sussex County, were taken into custody and kept in this jail for the safety of the terrorized inhabitants. British soldiers, Tories and other persons arrested for high treason, were kept there during the Revolution. When the Hessians were stationed at Trenton, a part of Colonel Rall’s own Grenadier Regiment was quartered in the old Court House. It is said that the walls around the rear and sides of the building were struck by a cannon ball fired from a Continental battery during the Battle of the Assunpink. Goods taken from the local Tories after the Battle of Trenton were stored in the jail of the Court House and were later returned to the rightful owners through the generosity of General Washington. Part of the old jail wall still stands in the rear of the present building and marks of where the cells had been may be seen in the basement of the building. The court room was the scene of many interesting trials, among them the case of the Rev. John Rowland, a travelling preacher. Here, too, the renowned Presbyterian minister, the Rev. William Tennent, then pastor of the church at Freehold, was tried for perjury. From these same steps on April 15, 1783, the proclamation of Governor William Livingston, declaring the cessation of hostilities between Great Britain and the United States, was read in the presence of the vice-president of the State, members of the Legislature, judges of the Supreme Court and other public officials, together with a great number of the inhabitants of the town and vicinity. On December 19, 1787, the ratification of the Constitution of the United States by New Jersey was read aloud at the old Court House in the presence of the principal citizens of Trenton. The events which centered interest on the Court House are too many to be noted here. Mention may be made, however, of the use of the Court House as a borough hall during the period when Trenton had its first charter. The Court of Commissioners appointed by the Continental Congress in 1782 to settle the land dispute between Connecticut and Pennsylvania met in this building, convening here on November 12, 1782. The New Jersey House of Assembly met in the Court House in November 1784. The Baptists held services in the building for a while and the city government met here until the enraged freeholders locked them out. By an Act of the Legislature passed March 4, 1780, the court was removed from Trenton to the house of Henry Mershon in Amwell Township (Flemington became the county seat for Hunterdon in 1791). Thereafter prisoners of war were kept in the Trenton court house and for a while the Admiralty Court held its sessions there. When the jail was abandoned by the County, the town jailor took over the jail for the custody of city prisoners. For a time preceding the year 1757, and especially during the French and Indian War, the colonists here were put in fear of a threatened invasion. Their desire that suitable protection be afforded them against the expected incursions of the savage Indians, and also that they be relieved of the burden and inconvenience of supporting soldiers quartered in their homes, found expression in petitions to the Legislature for the erection of barracks in the Colony, in which to house the troops of Great Britain mobilized for defensive purposes. In compliance with the prayers of these petitions the Legislature made an appropriation for the erection of the Trenton barracks, among others, and they stand today the only one remaining of the five built in 1757-58. That altho we your Petitioners do with truly Loyal and gratefull Hearts acknowledge how much we Owe to our Most Gracious Sovereign, and his Parliament, for furnishing us with repeated supplys of Troops at this Critical Juncture of Affairs when our all is threatened and endangered by our Inveterate and Potent Enemy, in Conjunction with surrounding nations of Cruel and deceitful Savages. And altho we are chearfully willing to exert the utmost of our power to render these his Majesties Troops perfectly usefull, and to answer the just end for which they were designed, in proportion to the number that shall from time to time fall to our share to support: Yet such is the Scituation of Trenton being so great a thoroughfare, and consequently so many soldiers continually passing and repassing upon their Severall Commands, and Quartered upon us Night and day, that unless by the Assistance of this Honourable House we can by some wholesome Law and legal Remedy be eased of this present Distress, the Country will be no longer able to bear the Burden, nor the Officers have it in their Power to keep their stragling Soldiers under due Command and Subjection. We shall not take upon us to dictate to this Honourable House what should be the method of this Remedy, but hope we may presume to offer our Sentiments, that if we could be provided with convenient Barracks it would answer all ends both as to the conveniency and safety that would redound to the Troops, as well as the great ease and advantage it would be to the Subject. We therefore your petitioners Humbly request that this Honourable House would speedily take it into Consideration and enable us to erect and Build such sufficient and Convenient Barracks for the purposes aforesaid or to give us such other adequate Remedy, in such Measure, and with such Power & Authority, and with such Clauses, Proviso’s and restrictions as to this Honourable House, in their Wisdom shall think meet and fitt. And your Petitioners as in duty Bound shall ever Pray, &c.
5 Stryker, The Old Barracks at Trenton, pp. 4, 5. 6 Journal of The Provincial Council, New Jersey Archives, Vol. XVII, p. 165. Soon after the passage of the law a lot was purchased of Mrs. Sarah Chubb, at a place on the west end of Front Street, where the River Road entered Trenton. The purchase money was forty pounds, and the lot contained about one acre. Joseph Peace, the father of Mrs. Chubb, purchased this lot in a tract of thirty-six acres, from James Trent, son of William Trent, March 10, 1732, for one hundred and seventy pounds, silver money. Joseph Peace, the father of Mrs. Chubb, did purchase from James Trent a tract of thirty-six acres, by deed dated March 10, 1732, but this tract lies south of Front Street, and consequently could not have included all of the barracks lot. In 1714 William Trent had purchased from Mahlon Stacy, Jr., 800 acres on both sides of the Assunpink Creek; the 500 acres north of the creek were bounded on the west by a tract of l00 acres then belonging to Nathaniel Pettit, on which the State House is now erected. Front Street, as laid out by Trent, ran westward to within 165 feet of the Pettit tract, where it was intersected and terminated by another (unnamed) street running north. When the Barracks were erected the building was placed directly over Front Street, closing off its west end as well as the unnamed street running north, which it intersected, That part of Front Street from Willow Street to the cast wall of the Barracks had always remained a street and it was impossible for Mrs. Chubb to sell it. The erection of the Barracks was commenced on May 31, 1758. 7 The deed for the lot does not appear to have been recorded. A diligent search for it in the office of the secretary of State and in the county clerk's office at Flemington fails to disclose it. The committee of the Provincial Assembly was quite right in its surmise that the expenses of building would vary greatly according to the place where the building was to be erected, as it is found in the minutes 8 that the Barracks at Trenton cost £1040 14s. 2d., plus £2446 6s. 9d. The building of the Trenton Barracks was pushed so rapidly that more than one-half of the structure was filled with soldiers in December 1758. It was fully completed in March 1759. 7 The Old Barracks at Trenton, pp. 10, 11, 12. 8 pp. 33, 52, 59. 9 The Old Barracks at Trenton, p. 12. The Barracks, as is well known, were erected in the form of three sides of a hollow square, the main building running north and south, with two wings, one at the northerly and the other at the southerly end, both extending eastward. General Stryker says it was built entirely of stone, undressed, two stories in height, the main building 130 feet in length and 18 1/2 feet in width, with the two wings each 58 feet in length. The time between the completion of the Barracks in March 1759, until December when the addition for the officers was built, is a period of months only, after which time until the partial demolition of the building for the opening of Front Street. the appearance of the building must have remained unchanged and included the officers’ quarters, which were, in fact, the Colonial house on the northwest corner of Front and Willow Streets. It is assumed that General Stryker was correct when he says that the officers’ quarters were built in December 1759 although he does not disclose the source of his authority nor does he mention the Colonial house or building as being those quarters. Chancellor Walker says that he was able to find only one person who could assure him of the historical fact that this building was the officers quarters, and part and parcel of the Barracks, in 1759, and that person was Miss Emeline R. Johnston, since deceased, whom he interviewed in 1910. She was then eighty-eight years of age, and in the full possession of her faculties. She told him her father purchased this very house in 1836 when she was fourteen years of age, and the family then moved into it. She and her sister resided there until the Civil War, when she left, and her sister, who is also now deceased, continued to reside there for many years afterwards. Miss Johnston not only informed the Chancellor that she had always understood that the old house was part of the Barracks and occupied by the British officers, but also that a daughter of Conrad Kotts (who lived on the west side of South Warren Street between State and Front Streets during the Revolutionary War), 10 who was sixteen years old at the time of the Battle of Trenton, had called upon the Johnston family in 1836 when they first moved into the Barracks house and in conversation told them that the house in which they were living was standing there during the Revolutionary War and was occupied by the officers in command of the troops occupying the Barracks. Miss Johnston also informed the Chancellor that when she lived in the house there was an iron plate in the fireplace in the kitchen, about one yard square, with the British coat of arms upon it, the lion and the unicorn being distinctly remembered by her. 10 Stryker, Trenton One Hundred Years Ago, p. 11. A few years ago there was found in the cellar of the State House a ground-floor plan of the Barracks which showed the old house as the officers’ quarters. The plan, or rather plans, referred to are in duplicate and have been photographed. These photographs now hang in the Barracks. From inspection it would appear that they are not the working plans from which the Barracks were built in 1758-59, but that they were made at a later date and for a different purpose as will now be shown. The French and Indian War ended with the establishment of peace with France in 1765. During that year the buildings seem to have been unoccupied, The attention of the General Assembly was called to this fact in May of that year, and they ordered that the perishable articles therein should be sold and the building kept in repair and rented. William Clayton and Abraham Hunt were appointed commissioners to carry out these orders of the Legislature and they immediately sold the furniture and rented the building and premises, a clause in the lease providing that the premises be surrendered up at any time, on suitable notice being given by the governor that they were needed for the use of the British soldiers. 11 Now it will be observed, by looking at the photographs of the plans, that the building was divided into rooms, which are numbered, and a price set opposite the number of each room. It is obvious that there was no one in Trenton in the Colonial period who for any reason or purpose desired to rent the Barracks as an entirety, and therefore it clearly appears that the building was divided into rooms for the purpose of renting to families and others, and this arrangement must have been made about the year 1765 and continued down to 1776. This plan, then, must have been made not earlier than seven nor later than seventeen years after the erection and completion of the Barracks, by a person contemporary with the structure as erected, who marked indelibly upon the plan the words “Officers Quarters” in making a correct drawing and truly stating a fact concerning the Colonial mansion on the corner of Front and Willow Streets. 11 The Old Barracks at Trenton, pp. 13, 14. At a meeting of the Provincial Council in 1767, William Franklin, the last Colonial governor, presented a communication from Earl Shelburn, one of the Secretaries of State for England, disallowing an Act of the Legislature of this Province for supplying the several barracks with necessaries for the King's troops, and for defraying other incidental charges. This Act was disallowed by the King upon the advice of the Privy Council, because the Act made the nomination of commissioners for carrying it out depend on an Act of the Legislature and not of Parliament. Another reason for the disallowance was that the articles with which the troops were to be supplied, and limiting the money to be paid therefor, was referred to as the usage of the Province. By authority of the Legislature of the Colony of New Jersey for the purpose of quartering British and Provincial troops to resist the threatened invasion by the French and Indians. In its original form presented three sides of a hollow square, which was intersected by the extension of Front Street, in 1813. The building was constantly occupied by troops from the time of completion until peace was established with France in 1765. From that time until the breaking out of the war which resulted in the independence of the United States it was practically disused. For a short time preceding the battles of Trenton and Assunpink it was occupied by the British troops, Hessians, Provincial recruits for the service of the Crown, and Tory refugees, and during the remainder of the war by troops of the Continental Line, State Militia and their French Allies. its present owner and preserver, by whom this tablet was erected on the 150th anniversary of the construction of the building. 12 Deed, Hunterdon County Clerk's Office, Vol. 1, pp. 222 ff. Afterwards, Front Street was continued westwardly from Willow Street to the State House lot, and the question is, when was this done? We find that on May 27, 1793, the surveyors of the townships of Trenton, Maidenhead and Hopewell agreed to lay out a road 42 feet wide beginning at the end of Front Strect, near the Barracks, from thence running in the middle of the road north 70 degrees, west 4 chains and 70 links to the State House lot, thence north 22 degrees, east 3 chains and 49 links out into the road leading from Abraham Hunt’s to Beatty’s Ferry (now West State Street) and that the said road should be opened on or before September 1, 1793. That part of the road running north into what is now West State Street was afterwards opened southerly to the river, and was first known as Wall Street, but from 1842 until vacated (as hereafter noted) was called Delaware Street. There are two or three conveyances of land on Front Street prior to 1800 which run to the wall of the Barracks; also one in 1809 and another in 1811. Mr. Raum 13 says that Front Street was continued to the State House yard through the Old Barracks in 1801. General Stryker 14 says that this was done in 1813. The opinion of General Stryker probably rightly expresses the date when part of the walls of the Barracks were demolished to make a continuous highway through from Willow Street to the State House grounds. General Stryker was more accurate that Mr. Raum; the latter says that buildings known as White Hall (Old Barracks) were erected by the King as barracks for his officers. This is a mistake. The King never erected the Barracks, nor was his permission even asked. True, they housed the soldiers of the King, but they were never built exclusively for officers, - in fact the officers’ building was erected after the Barracks proper. As there is no authority showing that part of the walls of the building was actually demolished for the projection of Front Street through the Barracks prior to 1813 (although the street was undoubtedly opened to the westward of the Barracks after it was laid out by the surveyors of the highway in 1793), General Stryker’s assertion, it appears, should be accepted. He says that the building was entirely stone. This is important when we know that at the time of the restoration the front wall of the officers’ quarters facing on the north side of Front Street was of brick, doubtless put there by the owner after the extension of the street, so as to give the dwelling a more modern appearance and in a measure to dissociate it from what it had formerly been. The stone wall has since happily been replaced. 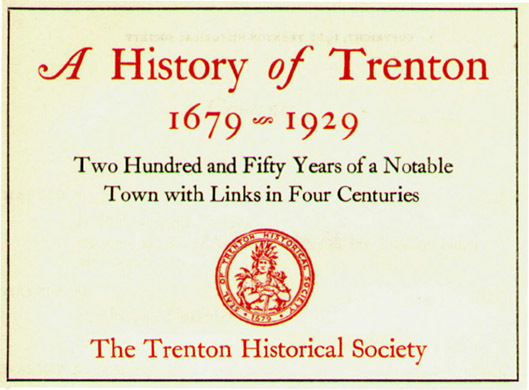 13 History of Trenton, p. 271. 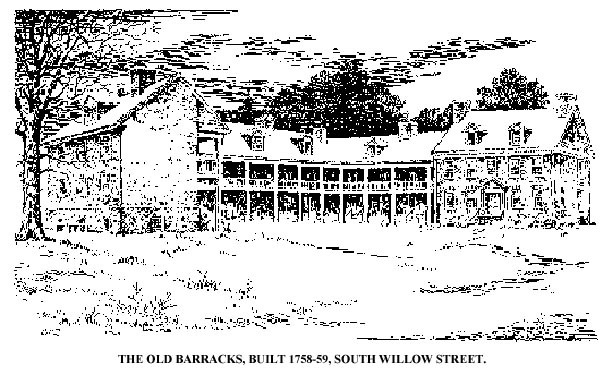 14 The Old Barracks at Trenton, p. 14. This historic structure has now beers restored to its pristine condition and presents exactly the same appearance it had when originally erected. The restoration was not difficult, - only expensive, and the State of New Jersey generously provided the necessary funds. That part of the structure on the south side of Front Street has never been altered externally, though the interior was undoubtedly changed by a division into rooms for renting to individuals, and that division is still maintained. The projection of Front Street westward was through the north end of the main building where it joined the north wing running easterly. None of the walls of that part which was left standing was demolished (except for the substitution of brick for stone in the front wall of the officers’ quarters, now restored) and they stand today as originally built. When the Indigent Widows’ and Single Women’s Home Society, which had occupied that portion of the structure known as White Hall on the southerly side of Front Street, removed to its new home on Spring Street, the Old Barracks was put up for sale. To prevent it from passing into the hands of speculators or contractors, and save it from demolition, some of the patriotic ladies of Trenton, through a committee, known as the Purchase Fund Committee and composed of Mrs. Samuel D. Oliphant, Mrs. Eliza Warren Hook, Mrs. William S. Stryker, Mrs. Washington A. Roebling and Mrs. James B. Breese, assisted by others, by great effort raised a fund and purchased the property, which they opened and maintained as the Old Barracks. The State, becoming interested, persuaded the City of Trenton to vacate so much of West Front Street as extended through from Willow to Delaware Streets and all of Delaware Street; bought the houses and lots on the vacated streets, and restored the Barracks to exactly the state that they were in when built, except as to the interior, which at first probably consisted of large rooms, some of which were afterwards undoubtedly made much smaller. The purchase fund committee and other ladies interested formed on June 13, 1902, the Old Barracks Association of Trenton, New Jersey, which the State has graciously continued as managers and custodians of the Barracks as an historical landmark and repository forever. By deed dated February 10, 1914,the Old Barracks Association conveyed, to the State of New Jersey, White Hall or that part of the property which was owned by the association. 15 The State, therefore, now owns the entire property, with the management and control, as stated, in the Old Barracks Association. 15 Deed recorded in the Mercer County Clerk's Office, Vol. 366, p. 434. The Old Barracks are now largely used as a museum of Colonial and Revolutionary relics. The main entrance is in the old officers’ quarters, the ground floor of which is one large reception room. On the second floor is an armory, where weapons are displayed. The ground floor of the main building contains the administration quarters and rooms of patriotic societies; and so, generally, does the second floor. The doors are open to visitors from 9 to 5 daily and the entire premises are open to inspection. On the second floor there is an auditorium running through the north wing, turning at right angles and running southerly for some distance through the main building, with the speaker's rostrum at the middle or turning-point, so that observation from that point can be had both ways. A similarly arranged banquet hall is located in the basement, with facilities for about 175 guests, where patriotic societies and the like may give dinners. Here in the house of Alexander Douglass Washington called a council of war on the evening of January 2, 1777, when the flank movement to Princeton was decided upon. Erected by the Trenton High School Class of 1903, February 22, 1902. The church stands upon the original site of the Douglass House, in which the conference between Washington and his generals took place on the night preceding the momentous Battle of Princeton. 16 The modest little two-and-a-half-story frame building was then owned by Quartermaster Alexander Douglass, who had turned it over to Brigadier General Arthur St. Clair for his headquarters. 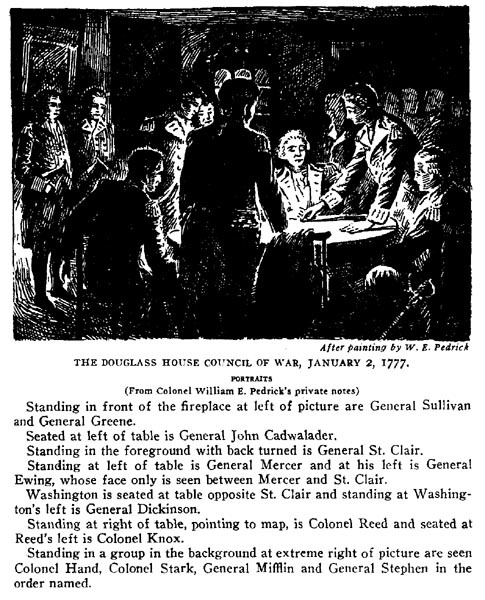 Situated farther from the enemy’s gunfire, incident to the second Battle of Trenton, than was General Washington’s own headquarters in the True American Inn, the Douglass House was selected as the meeting place of the little group of patriots upon whose determination the fate of the new-born nation depended. The Douglass House was built by George Bright about the year 1766 on lot No. 9 in the “New Town of Kingsbury.” Bright had purchased the lot from Robert Lettis Hooper on September 21, 1756, and conveyed it to Alexander Douglass on May 12, 1769. Douglass remained in possession of the property for over 66 years, and upon his death on April 4, 1836, devised it to Joseph Douglass, son of his brother William. Quartermaster Douglass had been one of Trenton’s true patriots, serving his country throughout the Revolution. He took part in the Battles of Long Island, the Assunpink and Princeton, and the battle at Springfield, N.J., on June 23, 1780. 17 Her body is interred in St. Michael’s churchyard, Trenton, an exception having been made in her case after the cessation of burials in that graveyard. 18 Trenton Sunday Advertiser, March 3, 1912. Following upon this discovery and identification, the late Adjutant General Wilbur F. Sadler became interested in the preservation of the shrine. In 1913 he obtained an option to purchase the house, and this was turned over to the Trenton Catholic Club with the understanding that the club should supervise the financing of the purchase of the property. Patriotic societies and the school children of Trenton were solicited to aid in raising the money needed for purchase and restoration. Within a few weeks a sufficient fund was raised wherewith to purchase the property but not sufficient to carry on the work of removal and restoration. The World War then interfered with the collection of further funds, but in 1923, ten years after General Sadler had turned his option over to the Catholic Club, Dr. William A. Wetzel, principal of the Trenton High School, successfully supported the club’s campaign for collection of funds, appealing to the children of the city and parochial schools for small contributions. The response was quick and generous. The total amount of money collected from all sources for purchase, removal and restoration of the Douglass House was $14,699.18. In 1923 the Douglass House was moved from Centre Street to a site in Mahlon Stacy Park set aside for its permanent location by the State of New Jersey. Here the house was restored. On January 2, 1926, the 149th anniversary of the second Battle of Trenton, the building was dedicated to the public. The officers of the Douglass House committee, a corporation not for pecuniary profit, which had charge of the entire project, were: William J. Backes, president; Vincent P. Bradley, secretary; Thomas M. Durnan, treasurer. Bow Hill, or “Beau Hill,” as the local wits of a century ago called the house, was the property of Barnt De Klyn, who, so the story goes, leased it for a season to his friend, Joseph Bonaparte, as a sequestered retreat for his protegee, the beautiful Annette Savage. Here on the outskirts of South Trenton, at the head of a long lane surrounded by beautiful shade trees, stood and still stands today the old red brick mansion to which over a century ago the former King of Spain brought the lovely Quakeress. The highly decorous society of Philadelphia had previously declined to “know” the fair Annette, when she lived there, and her friend and protector, Comte de Survilliers, as he called himself, sought for her what he hoped would prove a more favorable social atmosphere in the little provincial town on the banks of the Delaware. But if such was his expectation it was soon made evident that the local dispensers of social favors were no more inclined to take a complacent attitude towards Bonaparte’s “friend” than were the moral arbiters of the more sophisticated Quaker capital. Little is known of her life here, but it must have been a lonely one. In the early 1820’s Bow Hill was vacated, and its occupant departed for the wilds of Jefferson County, N.Y., where Bonaparte laid out a town which he called Diana, and built a villa to which he gave the title “White Horse.” Here Annette Savage presided as mistress until the Revolution of 1830 called Bonaparte back to France. Subsequently she was married to Joseph de la Foille, a young Frenchman then living in Diana. In addition to the child, Pauline Josephann, whose grave is in St. Michael’s churchyard, there appears to have been a younger daughter, Charlotte, who grew to womanhood and died in Richfield Springs in the last quarter of the nineteenth century. “Pine Grove,” a house which stood on the bluff overlooking the Delaware River, now apart of Riverview Cemetery, was also occupied by Annette Savage for a period. 19 See Heston, South Jersey, a history, p. 120; Woodward, Bonaparte', Park, and the Murats; Mills, Historic Houses of New Jersey, “Bow Hill”; Schuyler, A History of St. Michael’s Church, p. 358. 20 See Mills, Historic Houses of New Jersey, “The Hermitage”; and Schuyler, A History of St. Michael’s Church, p. 206. This mansion formerly stood near what is now the corner of West State and Prospect Streets. Attached to it was an estate of several hundred acres. It was first occupied by Sir John Sinclair, of the baronetcy of Nova Scotia. The Rev. Andrew Burnaby, an English traveller, visited Belleville when he was in Trenton in 1759. Subsequently it belonged to Brigadier General “Lord” Stirling whose correct name was William Alexander, but who claimed a title from the English Crown and immense tracts in Nova Scotia. 21 Stryker, The Battles of Trenton and Princeton, pp. 348-9. 22 Hall, History of the Presbyterian Church, 2nd ed., p. 151. The Dickinson house, the old stone mansion, sometimes known as the “Grange” but more properly as the “Grove,” so called because of the fine grove of trees which surrounded the house, situated at the corner of North Clinton and Girard Avenues, is the oldest building in East Trenton. It was built, probably in 1792, by Samuel Dickinson, son of General Philemon Dickinson. He was born in 1770 and died in 1839. By profession he was a lawyer but did not practise. His wife was a daughter of Samuel Meredith, the first treasurer of the United States. After the death of his father in 1809, Samuel Dickinson moved from the “Grove” to the Hermitage. His eldest son, John Dickinson, and family, were the last of the name to occupy the mansion. John Dickinson, among others in the locality, attempted the culture of silk-worms and planted many mulberry trees for the silk-worms to feed on. Mulberry Street took its name from these trees. Silk culture as a local industry proved a dismal failure. About 1860 the “Grove” passed out of the Dickinson family. Since that time the house has changed hands a number of times. At one time it was a saloon and later a branch of the Y.W.C.A. In 1928 it was bought by the trustees of the Free Public Library for branch library purposes. THE inns and taverns 23 of long ago filled a large place in the life of the community. They were the social clubs of an age which had so few of our modern conveniences. Public bodies utilized their chambers for the transaction of official business. Travellers over poor roads had to break their journey frequently for comfort and refreshment and the little inn with its lights aglow after nightfall was a welcome sight to many a stranger. Therein were food and shelter for man and beast. In coaching days, Trenton was an important stopping point and Warren Street, on the direct line of traffic between New York and Philadelphia, was lined with houses of public entertainment. As the capital of the State and the place of meeting of the Courts and the Legislature, this city had to be prepared for unusual numbers of transient guests. The following pages describe in some detail many of the hostelries which have served Trenton's residents and visitors from early Colonial times until the present. 23 “Ordinary” was the general term applied to public places where transients were accommodated. Afterwards the terms “inn” and “tavern” were applied to them. These terms have been used interchangeably by almost everyone. However, there is this distinction - that an inn is a house which is held out to the public as a place where all transient persons who come will be received and entertained as guests for compensation, while a tavern, according to the early nomenclature, signifies a place where food and drink without lodging may be obtained. The Ligonier stood on the northwest corner of Queen (Broad) and Second (State) Streets, and was kept by Robert Rutherford. It is described by many writers as located at the northwest corner of Queen and Front Streets, but this is an error. 24 New Jersey Archives, Vol. XXIV, p. 460. 25 ibid., Vol. XXV, p. 314. In August 1750 Dr. Cadwalader advertised all his Trenton properties for sale, among them “a large commodious corner brick house, two stories high furnished with three good rooms on the lower floor and a large entry through; four good rooms on the upper floor and four lodging rooms plaistered in the upper story, with good cellars, stone kitchen, garden and stables, situated in Queen Street in a very public part of the Town of Trenton very convenient for any public business.” 26 He conveyed the property on February 4, 1754, to James Rutherford, “yeoman,” who in turn conveyed it to Robert Rutherford, his nephew, by deed dated July 27, 1759. The deed refers to the grantee as “tavern keeper”; Robert Rutherford had been licensed to keep a tavern three years before. 26 ibid., Vol. XII, p. 661. Under execution of several judgments entered in Hunterdon County. John Barnes, sheriff of that County, on April 10, 1771, sold the Ligonier Tavern, as the property of Robert Rutherford, to John Johnson of Perth Amboy. 27 The latter on April 23, 1778, conveyed it to Joseph Millner, and it was afterwards commonly known as Millner’s corner. 27 Deed Book G. 3, p. 78, Office of the Secretary of State.
. . . About that period  there one day drove up to the tavern, in a carriage and four, an English officer, by name of Fortescue. Colonel Fortescue dined at the tavern, and after dinner had a conversation in private with one of Rutherford’s daughters. Within two hours after this conversation Francis Mary Rutherford had, notwithstanding her sisters’ entreaties, quitted her father’s house in company with Colonel Fortescue. With him she went to Paris, where after a few years he died, leaving her, it is supposed, a considerable sum of money. On his death she quitted Paris and came to England; and here she married a gentleman of considerable property, named Shard. In 1798 Mrs. Shard had a great desire to discover what had become of her father’s family, [but] inquiries were fruitless - her brother and three sisters were dead . . . . In 1819 Mrs. Shard died a widow, childless and intestate. No next of kin appearing, the Crown took possession of the property. In 1823 an attempt was made to set up a document as the will of Mrs. Shard, but it was declared a forgery. In 1846 the present plaintiff made a claim to the property, setting up that claim through a Mrs. Davies, who was alleged to be first cousin of the deceased . . . . The Vice-Chancellor came to the conclusion that as between the Crown and the claimant the latter made out a case . . . but as it did not follow that there might not be still nearer relatives than the claimant, . . . the matter must go back to chambers for further inquiries. After Robert Rutherford left the Ligonier, Rensselaer Williams occupied the building in 1768 as the Royal Oak. Williams was from Middlesex County, and was first licensed to keep a tavern in Trenton as early as 1766. Where his first inn was located has not been ascertained. 28 New Jersey Archives, Vol. XXVIII, p. 461. 29 New Jersey Archives, 2nd Ser., Vol. I, pp. 8, 79. 31 See footnote, New Jersey Archives, 2nd Ser., Vol, I, p. 59. 32 New Jersey Archives, 2nd Ser., Vol. II, p. 149. 33 See Deed, Highbee to Tucker, Vol. XXXV of Deeds, p. 175, recorded February 2, 1856, in Mercer County Clerk’s Office; and Deed, Morris to Smith, Book A.F., p. 236, Secretary of State’s Office. 34 Book A.L, p. 428, Secretary of State’s Office. 35 Minutes of Provincial Congress and Committee of Safety, p. 495. 36 New Jersey Archives, 2nd Ser., Vol. II, pp. 10, 48, 92. On the southwest corner of King and Second (Warren and State) Streets, where the Mechanics National Bank now stands, stood the City Tavern. On September 20 and 21, 1730, Peter Bard conveyed to John Dagworthy a lot 66 feet on King Street by 330 feet on Second Street. Dagworthy at that time owned and lived in the house located immediately south of this corner lot. On the corner lot Dagworthy built a stone house two stories high with gable roof. The building measured 45 feet front by 53 feet in depth, with a kitchen in the rear containing rooms for servants on the second floor. It was the handsomest and most commodious house in Trenton in its day. From 1740 to 1742 it was the official residence of Governor Lewis Morris. Mr. Dagworthy died in 1756 and in 1760 the property was sold by his executors to Samuel Henry, who occupied it as his residence until 1780. Henry leased the property to Jacob Bergen, who, after making extensive changes, opened it as a tavern under the name of the Thirteen Stars. In 1780 the General Assembly of New Jersey is said to have held its sessions in this place. About 1781, Mr. Bergen went to Philadelphia to conduct the Bunch of Grapes, and one John Cape took over the Thirteen Stars, changing its name to the French Arms. Cape quit the inn in 1783 and Bergen returned to take over the management of the place. When the Continental Congress met in Trenton in 1784, its sessions were held in the Long Room of Mr. Bergen’s French Arms. It was here that the Marquis de Lafayette took leave of the Congress on December 11, 1784. When that body adjourned on December 24, 1784 the commissioners who had leased the property for the use of Congress for a period ending March 31, 1786, assigned the unexpired term to Francis Witt. Witt had entered the tavern business a few years previously by taking over Joseph Clunn’s inn, the Alexander the Great, later changing its name to the Blazing Star. Carrying the Blazing Star sign with him to his new stand, Witt substituted it for the French Arms. After Witt left the inn on April 1, 1789, Henry Drake took possession, naming it the City Tavern. Here it was that Washington was dined and received by the citizens of Trenton, April 21, 1789, while on his way to New York to be inaugurated the first President of the United States. Earlier in the day he had been received and greeted by the ladies of Trenton at the Triumphal Arch erected over the Assunpink Bridge. Drake was followed by Joseph Broadhurst in 1793. Broadhurst, as well as the many subsequent proprietors, continued the inn under the name of the City Tavern. In 1837, when The Mechanics and Manufacturers Bank purchased the property, the tavern was taken down and the banking house erected. The American House corner has been the site of a tavern or hotel for over two hundred years. The present American House is on the southwest corner of Warren and Hanover Streets. Prior to 1849 it was known as the Rising Sun Hotel. On July 30, 1725, James Trent conveyed the lot, on which the American House now stands, to James Severns. The latter, on August 13, 1730, conveyed it “together with the new house or tenement built by the said John Severns on the hereby granted premises” to William Allen. The deed conveys a lot 66 by 165 feet commencing 330 feet from the northwest corner of State and Warren Streets. This is the northerly part of the present lot occupied by the American House. It was advertised for sale by Samuel Tucker, sheriff, under an execution as the property of John Allen in 1764. 38 This execution was satisfied as Isaac Allen, a Trenton lawyer, inherited the property from his father John Allen. During the Revolution Isaac Allen remained loyal to Great Britain and joined His Majesty’s troops under the command of Sir William Howe in New Jersey in December 1776. As a consequence he was attainted August 1, 1778, and his whole estate confiscated and sold. Included in his property was his dwelling house of stone, two stories high, in Trenton. Stephen Lowrey purchased it from the commissioners of forfeited estates on March 20, 1779. On July 26, 1792, Lowrey conveyed the premises to Colonel Isaac Smith, who by profession was a physician and not a lawyer, but was placed on the Supreme Court bench in February 1777. He was later elected to Congress and was the first president of the Trenton Banking Company, serving from February 13, 1805, until his death August 29, 1807. 38 New Jersey Archives, Vol. XXIV, p. 324. The first mention of the Rising Sun Tavern appears in an advertisement in the Federalist of May 2, 1808, wherein John V. Hart and Samuel T. Mahette announced that they had opened a new store in Warren Street next door south of the Rising Sun Tavern. At that time the Rising Sun was conducted by John Anderson who, in 1801, had quit the Indian Queen to be succeeded there by Peter Probasco. Anderson ran the Rising Sun until 1821 when he was succeeded by Jacob Herbert, who had formerly been at the City Hotel. Herbert died in 1825 but Mrs. Hannah Herbert, his widow, continued the Rising Sun until 1828, when she removed to the City Hotel. In 1828 Joseph Wildes, who came from Mount Holly, took over the tavern and ran it until 1831. In December of that year we find Hannah Wildes running it. Joshua Hollinshead followed in May 1834 and ran it until 1842. The next proprietor was Joshua English, who remained until February 2, 1847, when a great fire practically destroyed the Rising Sun. At the time, the hotel was pretty well filled with members of the Legislature and other guests but they were either at the State House or at a lecture at the City Hall. The loss to the owner, Joseph Wood, was estimated at $12,000. Mr. Wood immediately rebuilt the house and on June 8, 1847, it was opened as the American Hotel with Charles Wyckoff as its new proprietor. Mr. Wyckoff continued at the hotel for a number of years. Then Isaac Heuling had it for a while. In February 1857 John V. D. Joline, formerly of Princeton, purchased it. Some of the subsequent proprietors were Edmund Bartlett, Walter F. Bartlett, Charles Kropp, and others. The American House Realty Company (all members of the Kuser family) are now the owners, with Benedict C. Kuser as manager. It contains about seventy-five rooms. For many years this was the principal hotel in the city and many great men have been guests there. President Monroe arrived in Trenton on June 7, 1817. He was escorted to the Rising Sun Hotel and remained in Trenton until the morning of June 9. President Jackson stopped at Trenton on June 11, 1833, when on his tour through the States. He was received by the citizens in large numbers, and dined at the Rising Sun Hotel. General William H. Harrison stopped there on September 9, 1836. President James K. Polk who had been invited to be present at the Independence Day celebration on July 4, 1847, was received by the citizens of Trenton with great rejoicing and after the speeches at the State House he was escorted to the American Hotel where he dined. Daniel Webster was a guest at the American Hotel March 20, 1852, when he appeared as counsel for the Goodyears in the celebrated India rubber case in the United States Court, which is discussed elsewhere in this History. The Indian King Tavern is said to have stood on the west side of North Warren Street, facing .East Hanover. As far back as 1782 we find a printed reference to the Indian King in a notice of Jacob Beck, a blue-dyer, of Germantown, Pa., which informed his customers that they might send their yarn, cloth, etc., to him by leaving it “at Mr. Isaac Britton’s, inn-keeper, at the sign of the Indian King in Trenton.” 39 No other mention of this hotel by name appears until August 16, 1853, when the State Gazette informs its readers that the ancient building occupied by Benjamin S. Disbrow at 88 Warren Street was being torn down. The newspaper then went on to say that the place had at one time been known as the “Indian King Tavern” and that it dated back to the Revolution. In 1800, continued the article, Peter Probasco kept the place, then known as the Eagle Tavern, but for the past twenty or thirty years it had not been used as a tavern. 39 New Jersey Gazette, March 6, 1732. 40 New Jersey Archives, 2nd Ser., Vol. V, p. 364. 41 Trenton Federalist, October 2o, 2827. 42 ibid., April 6, 2828. 43 Deed Book I, p. 267, of Hunterdon County. 45 Deed Book I, p. 442, of Hunterdon County. The Alexander the Great was sold to Francis Witt, then located at the French Arms, by Robert Chambers and Francina, his wife, on August 22, 1787. 46 Witt never moved back to the stand he had once kept, nor was the place ever used again as a tavern. It is described in the deed from the Chambers to Witt as lying between the house late of Dorothy Wright on the south and James Machett on the north. The tavern lot was conveyed by George T. Olmstead to Theodore Blackwell on June 30, 1842 47 and the latter on March 31, 1853, conveyed it to Benjamin S. Disbrow. In the same year the old structure was pulled down and a large iron-front building erected in its place. 48 Mr. Disbrow used the new structure as a furniture store until his death. After that it was used by William S. Sharp as a book- and job-printing establishment. The Daily Public Opinion was printed in this office. Later the ground floor was turned into a billiard-room, restaurant and saloon, which at different times bore the names of the Galaxy and the Alhambra, Frederick Caminade, Edward Updegrove and James H. Letts being proprietors. Finally, in 1928, the building was torn down to make way for the Lincoln Theatre. 46 Deed Book I, p. 269, Hunterdon County. 47 Deed Book D, p. 613, of Mercer County. 48 State Gazette, August 16, 1853. 49 State Gazette, June 12, 1857. Colonel Gottlieb Rall had made the Potts house his headquarters when he and his Hessians came to Trenton in 1776. After the Battle of Trenton, General Washington and General Greene visited the wounded Colonel at this house and offered their consolations before leaving him. 50 See reprint in State Gazette, June 12, 1857, of the original advertisement which ran January 10, 1785. After Mr. Potts had sold the house in 1785 it was converted into a tavern. When General Charles Cotesworth Pinckney, Ambassador to France, visited Trenton early in November 1798 he was tendered a reception at the tavern, then known as the City Hotel. James Ewing, mayor, made the address of welcome and the distinguished guest replied. The hotel was the scene of many receptions and meetings in years following. In February 1803 the question of uniting the Delaware and Raritan Rivers by a canal was discussed here by a meeting of the citizens. The State Bank opened its subscription books at the City Hotel in February 1812. In 1816, Richard Davis and William Scott advertised the hotel as “long kept as a public house” and one of the finest stands in Trenton. Soon after, the building was turned into a boarding house, John Mount, Jr., being one of the keepers. On December 28, 1838, the place was reopened as a tavern under the name of the Trenton City Hotel, by John Van Fleet. 51 During Mr. Van Fleet’s proprietorship, travelling shows frequently set up their attractions at the City Hotel. 51 New Jersey Gazette, December 28, 1838. Dr. Jacob Quick became the owner of the property under a conveyance made by Samuel Evans, July 23, 1853. He demolished the building four years later 52 to make room for a brick dwelling house in which he afterwards lived and had his office. On March 27, 1865, Dr. Quick sold the property to the Right Rev. James Roosevelt Bayley, Roman Catholic Bishop of Newark. In 1866, Father Anthony Smith began the building of Saint Mary’s Church over a part of the site of the old tavern, leaving Dr. Quick’s house undisturbed that it might be used as a rectory. A few years later Dr. Quick’s house gave way to the present five-story brownstone rectory, whose foundation covers about two-thirds of the foundation of the old tavern. 52 State Gazette, June 12, 1857. Some of those who operated the City Hotel at one time or another, besides those mentioned, were: John Anderson, Peter Howell, Scott and Herbert, the Widow Harvey, Hannah Herbert, Nicholas Bendel and Samuel Heath. Probably the first inn to be built in Trenton was that owned by William Yard. He had settled here in 1710, and in 1712 purchased from Mahlon Stacy, Jr., about two acres of land. On this land he built a substantial stone dwelling, part of which is still standing at 24 East Front Street, at the corner of Warner’s Alley. Before the old Hunterdon County Court House was built in 1719, the Common Pleas and Quarter Sessions Courts were held in public houses. It was at William Yard’s house, then in Hopewell township, that the first session of the courts of the newly created county of Hunterdon were held. Yard was appointed the first clerk of these courts, and was such in 1720, when he issued a subpoena to several witnesses to appear “before our Justices of the Peace at the next General Quarter Sessions of ye Peace, to be held in and for the said county, at Trenton, then and there to give evidence,” etc. This indicates that as early as 1720 the town was recognized by the courts as bearing the name “Trenton.” It also shows that there was a court house here in 1720, for had the court met in any private building the witnesses would have been specifically directed to come to such place in the subpoena. The Madison House was an ancient inn standing on Greene Street (North Broad) nearly opposite to Academy Street, where a number of brick houses and stores were built in the centennial year (1876) and called the Centennial Row, Its last proprietor was Charles Fow, who remained until the building was taken down. From time to time it had been kept by William Morton, Nathaniel Richardwn, Solomon Sutphin and Samuel Mulford. During the Rebellion this tavern was used as a recruiting station. Like the Lafayette House close by, the Madison flourished while the street markets on Greene Street were maintained. 53 State Gazette, February 20, 1830. 54 ibid., November 19, 1845. 55 ibid., November 1, 1849. On the south side of State Street (15 and 17 East State Street), about 150 feet east of Warren Street, stood the Bull’s Head Tavern. Sylvester Doyle was the proprietor prior to 1801. In May of that year it was taken over by Amos Howell. From 1808 to 1824 Thomas Atkinson ran it. In the latter year Atkinson removed to the large three-story building on the northwest corner of Front and Warren Streets. A livery stable used by him in connection with the latter site was on the opposite side of Warren Street, the northeast corner, which remained for many years the exchange stable for the post riders going through Trenton. The Bull’s Head Tavern on State Street was sold in 1817 as the property of the late Sylvester Doyle. It was a two-story frame building. Thomas Combs became its proprietor in 1824 and named it the Farmers Inn. Charles Green kept it later. In 1847 Joshua English built the large stuccoed building, still standing on the same site. He called it the Mansion House, and ran it until his death. 56 New Jersey Archives, Vol. XXIV, pp. 212, 375. The United States Hotel was located on the site of the present Trent Theatre on the west side of Warren Street. On this site as early as 1788 stood the Indian Queen Tavern. It was built of stone, two stories high with a large brick kitchen adjoining. A large stable, carriage house, shed, ire house, etc., were in the rear. In 1801 the Indian Queen Tavern was in possession of John Anderson, who advertised that he “is about to leave Town and will dispose of his household goods.” Enoch Green took possession of the Indian Queen about 1820 and ran it until his death in 1827. John D. Green then conducted it until his death on December 25, 1830. His widow Frances ran it until 1835 when she went to the City Tavern. During the Green regime the tavern seems to have been the museum of Trenton. On March 31, 1823, an exhibition was advertised to be held there on April 1 and 2, of “a large and learned Elephant.” An “Egyptian mummy three thousand years old” was on exhibition there during the second week of May 1825; and during the first week of June 1826 “live rattlesnakes lately taken in the interior of Pennsylvania and New York” were on exhibition at the inn. Joshua English took over the tavern in 1835, and advertises that he has furnished it “in a style inferior to none in the said city.” English left the inn sometime in 1842, after which we find him interested in the Mansion House on State Street. Charles Howell next followed him as tenant from 1842 to 1847. In January 1847 Samuel Kay became proprietor of the Indian Queen and opened it under the name of The United States Hotel. It saw several other landlords up to the time it was razed, including Austin Walton and J. J. McCarthy. The Phoenix Hotel stood on the west side of North Warren Street where Hanover Street now cuts through. On its site previously stood a dwelling which is commonly supposed to have been the residence of President John Adams when he, along with the other heads of the federal departments, fled the yellow fever prevalent in Philadelphia in 1799. The first mention of the dwelling being used as an inn or tavern is found in an advertisement of William J. Leslie57 in which he announces that he has opened a hotel in Trenton directly opposite the postoffice, next door to the Rising Sun Tavern. Leslie ran the Phoenix Hotel until 1824, when he removed to the house of Philip F. Howell on the east side of Warren Street, immediately south of St. Michael’s Church, to open an hotel known as the Mansion House. In 1831 he changed its name to Temperance Hall. Mary Wright was the owner of the Phoenix in 1842; at that time it was called the Phoenix and Cornucopia Hotel. 57 Federalist, April 3o, 1821. John Miller, it would appear, was in possession of the Phoenix Hotel from 1848 to 1864. In the latter year, Captain Michael Dewan became the proprietor. On his death in 1869 his brother, William, took over the place. Other proprietors of the hotel include: Peter Smick, Charles Green, Enoch Cook, Norbury Bashford, William S. Yard and James Davison. In 1870 the city bought in the lot on which the Phoenix stood in order to extend the present West Hanover Street. The price paid to Mrs. Miller, the then owner, was $14,780. At that time William Harley ran the hotel. After he had conducted a sale of his personal effects in February 1871, he moved out and the building was demolished to make way for the new street. From the following advertisement appearing in the Emporium and True American, on January 31, 1835, it would seem that the tavern stood much nearer to Broad Street: “The old established Tavern Stand, long kept by Mrs. Bond, sign of the Fox Chase, in the city of Trenton, at the head of Greene Street, on the commencement of the straight Turnpike to New Brunswick, is to be let, and possession given on the first day of April next.” Joseph Bond ran the Fox Chase Tavern in 1776, and continued to do so until his death on October 25, 1826, an aged inhabitant of Trenton. He had married Mary, the widow of William Cain, a former ,proprietor. She survived Bond also. The subscriber, having completed his new and spacious building at the Depot in State Street, 58 is now prepared to receive visitors. His house has been built for a hotel, and the rooms have been arranged as to afford every convenience to those who may occupy them, having been thoroughly furnished with beds, bedding and furniture. Gentlemen and Ladies, who may visit Trenton for a short time, will find every accommodation at this Hotel, besides the desirable convenience of being near the Depot, and but a few steps from the cars. The location is a very pleasant one, being near the cottages, and an equal distance from Trenton and South Trenton. - Peter Grim, Jr.
58 The old Camden and Amboy Railroad station stood across the canal from the hotel. The Rail Road House for a number of years was a popular stopping place for travellers, members of the Legislature and theatrical performers. Grim ran the hotel until his death in 1847 when Joseph Cunningham, an active Democratic politician and postmaster at Trenton by appointment from Andrew Jackson, purchased the property and changed the name to the Tremont House. On March 13, 1848, Henry Clay, the famous statesman and orator, visited Trenton, while touring the States as a candidate for the presidency. Upon his arrival at the depot he was escorted to the Tremont House. Here in response to the greetings of a large crowd of citizens gathered about the building, he ascended the balcony in front of the second-story windows and made a brief address. Following the death of Cunningham in 1869 Lucius R. Wright became the proprietor. The late John J. Brown owned the building in 1904 and remodelled it It now belongs to his widow, but is no longer used as an hotel. The National Hotel stood on the north side of Hanover Street, midway between Broad and Warren, at 10 and 12 East Hanover. It was a three-story brick building, with a driveway at the side and a spacious stableyard in the rear. The hotel was patronized by legislators during the sessions of the Legislature and by many of the show people who came to Trenton after the middle of the last century. Buffalo Bill and his troupe made this place their headquarters. One of the earliest owners of the National Hotel was Runyon Toms. We find his advertisement in the June 22, 1860, issue of the Daily True American, wherein he announces that he had but recently enlarged his yard and stable room. Henry Earley and William H. Earley were two other proprietors. After them, the Johnson family, originally of New Brunswick, took over the operation of the hotel. Mrs. Johnson, a widow, and her four popular sons, John, Thaddeus J., Oscar and Frank, managed the hotel so that it soon became a favorite eating and stopping place for those remaining overnight in Trenton. Competition soon .put the National Hotel out of the race. The lower floor was divided into three stores while the upper stories were turned into apartments. Late in 1928 Sears Roebuck and Company purchased the property and tore it down. In its place a three-story brick building was built, to be used as show-rooms and a place for the sale of that company’s goods. In the summer of the same year, Thomas Barnes, Jr., and William Van Hart opened a shoemaking establishment on the site, trading as William Van Hart and Company. In February 1822 David McKean advertised the corner for rent, John Voorhees being named as occupant . 59 In 1824 another advertisement, announcing the place for rent or sale, mentions Peter Smick as the occupant. Smick kept a tavern on the premises. In April 1826 Joseph Palmer took over the tavern, his notice announcing that he had removed to “the tavern stand, Sign of the Golden Swan.” 60 Following Palmer as proprietors came Joel Gordon, Isaac Pitcher, Mrs. Pitcher and then Samuel Quicksall. 59 Trenton Federalist, February 4, 1822. 60 The Emporium, April 15, 1826. Judge David Naar, who had been publishing the virile Democratic sheet, The Daily True American, at his establishment one door north of the old City Hall, which stood on the northeast corner of State and Broad Streets, purchased the Golden Swan corner in December 1855 and moved his publishing house there about two years later. The offices and printing shop were located on the first floor, while the Naar family occupied the upper stories. At about this time, Jewish religions services were held on the second floor of the building. On April I, 1872, the Daily True American removed to the southeast corner of State and Broad Streets. Mathias Miller and John Hartman, trading as Miller & Hartman, conducted an upholstering and furniture business on the Golden Swan corner after the departure of the Naars. A few years ago, Carll Sons’ Company occupied the place as a tinsmith shop. In 1907 J. Harry Hearnen began business as a locksmith next to the corner; in 1921 he took over the corner property and set up an extensive business in electrical, auto supply and radio goods, in addition to a lock and safe establishment. Just south of the AssunpinkCreek stood the True American Inn, destroyed by fire in 1843 during the proprietorship of Henry Katzenbach, whose young daughter lost her life in the flames. This inn was the headquarters of General Washington on the morning of the second Battle of Trenton, January 2, 1777. At that time it was conducted by Jonathan Richmond. The inn was located on the east side of South Broad Street just below the line of Factory Street. About 1834 it was kept by Joseph Palmer, and on his death was advertised for sale in the True American for January 19, 1835. On the same lot judge John H. Stewart, in the latter part of the ‘7o’s, erected the building now occupied as a clothing and haberdashery shop by Harry Haveson. On the opposite side of Broad Street, about 200 feet farther south, long stood South Trenton’s National Hotel. It was once called Iron Hall. It is said to have first been kept as an hotel by Margaret Gordon; John McGuire acquired it in 1841 and kept it as an hotel until his death in 1856. Robert Dowling was its proprietor during the ‘7o’s and ‘8o’s of the last century and from him it derived the name of Dowling’s Hotel. This place was conducted as an hotel continuously for about one hundred years. Dowling greatly enlarged it. When the Knights of Labor became powerful as a national and local body, the hotel was acquired as Trenton headquarters. Transfer of the property from Robert S. Dowling to Knights of Labor representatives occurred July 1, 1886. For some years it figured as an industrial center where labor’s cohorts assembled at frequent intervals, T. V. Powderly and other national labor leaders appearing on various important occasions. This interesting stage of the old hotel’s existence ended April 13, 1893, when the “Organized Labor Hall Association of Mercer County” transferred its title to John A. O’Neill. Litigation followed and the property was held from April 29, 1893, to April 1, 1901, by Hugh H. Hamill and Benjamin M. Phillips. Later landlords were William C. Cobine, John J. McCarthy, Harry and Samuel Levin, Benjamin Robinson, Leo Eisner and Solomon and Samuel Shankman. About 1915 Samuel Levin took it over and added rooms, increasing its size to double of what it had been. Samuel Shankman in 1925 purchased the property and turned it into fifteen apartments and several stores. The Mercer County Hotel was located on the northeast corner of South Broad and Market Streets, the present site of The Mercer Trust Co. It stood directly opposite the court house - hence its name. Its proprietors successively were Margaret Gordon, Charles D. Warner and George Davis. It was discontinued as an hotel long before the coming of the bank building, and was used for years as a drug store with a boarding house overhead. The oldest hotel building south of the creek, though it is no longer kept as an hotel, is the Eagle Hotel, on the northwest corner of South Broad and Ferry Streets. It is said that this building was occupied as an hotel during the Revolution. The lot on which it was built was No. 34 on the plan of lots of Kingsbury, laid out by Robert Lettis Hooper about 1754. Hooper conveyed the lot, 60 by 181 1/2 feet, to George Bright by deed dated July 27, 1763. Bright conveyed it to Robert Waln on October 10, 1765. The latter built a house on it soon after obtaining title, the house being but one-half of its present size, and standing on the northerly part of the lot. It is referred to by Evan Runyan in his advertisement in the New Jersey Gazette of February 6, 1782, as the brick house at the ferry lane. 61 Gideon H. Wells was the owner of the property on October 1, 1805. 61 New Jersey Archives, 2nd Ser., Vol. V., p. 370. The Eagle Hotel was closed as a tavern when its present owner, Dr. Henry M. Beatty, acquired it in 1896. Prior thereto it had been the scene of many Third Ward political gatherings and earlier still, in the period when the Eagle race course was at the height of its success, it was the stopping place of many of the well-known horse owners of the country who used periodically to assemble in Trenton for races of national importance. There was abundant stabling in the rear. Among the Eagle Hotel’s landlords the most famous was William Doble of country-wide fame in the equestrian world. This tavern in Revolutionary times and later was a landmark where many travellers halted, coming from or going to the ferry at the foot of Ferry Street. The usual route was up Ferry to Broad and thence to the center of the town, in the era before Warren Street was opened below Front Street. Other hotels of note in South Trenton were located in the Fourth Ward. The Jennie Lind, named after the famous singer, stood on the southeast corner of South Warren and Ferry Streets. It was taken down when the present row of brick houses was built about 1900. At one time this was the hotel connected with the Trent Ferry, and was called the Ferry House. The Bloomsbury House is located at the foot of Ferry Street and faces it. It now belongs to the city, having been purchased for purposes in connection with the municipal wharf. It was built prior to 1800 but its history is unknown. The Railroad House (which is not to be confused with the Rail Road House, as the Tremont House was first named) was situated at the northeast corner of .South Warren and Bridge Streets. When the railroad ran through this part of Bridge Street, the house stood just north of its line of travel - hence its name. The house still stands, having been converted into an automobile salesroom. Cornelius Vanderveer, Charles F0w, Dominick Caminade, Peter Rafferty, Joseph O’Neil and John Aiken, have been a few of its proprietors. The Delaware House on South Warren Street was prominent as a political and sporting headquarters for years. In the Sixth Ward there were but two inns, the one located on the almost forgotten “prairie” between Race Street and the River, south of Cass (formerly Washington) Street. It was kept by S. Lake and called the Raftsman’s Inn. The other was the Delaware Inn on the east side of Lamberton Street below Landing. The building is still standing. These were frequented by the rivermen, when rafting and the catching and curing of fish were real industries at Lamberton. The Hotel Windsor was erected in 1881 by the late Captain Woodbury D. Holt, an able and prominent lawyer of the latter part of the past century. The hotel is on East State Street, opposite the First Presbyterian Church, with a frontage of 63 and a depth of 240 feet. Captain Holt was able to keep the property only for a few years. In July 1894 it was sold in foreclosure proceedings to the late A. V. Manning, the furniture dealer. After several proprietorships it has passed to The Trenton Trust Company. Originally the lobby was on the ground floor in the west half of the front of the building and the parlors were on the second-floor front. After Mr. Manning acquired it the ground-floor front was turned into stores. At the present time F. W. Woolworth’s five-and-ten-cent store occupies the entire front floor. In 1924 the hotel was completely remodelled, the lobby, parlors and dining-rooms being transferred to the second floor, and all the furniture renewed. Besides this an entirely new heating and lighting system was installed, and practically all the rooms equipped with private baths. The hotel has 125 rooms. Remodernized, it was opened for business on April 21, 1925, by the present.proprietor, Joseph G. Buch. 62 Deed Book A.T., p. 169, Secretary of State’s Office. In March 1798, Moore Furman sold this lot and his residence thereon to the State to be used as the official residence of the governor, and it was thereafter popularly known as Government House. Several attempts were made by the State to sell the place during the early years of the nineteenth century, but the efforts were not crowned with success until April 2, 1845, when Samuel R. Gummere, Samuel R. Hamilton and Stacy Paxton were appointed commissioners to make sale of the house and lot. Messrs. Joseph Wood, Dr. John McKelway, John A. Weart and Joseph C. Potts purchased the property for the sum of $13,800. The new purchasers immediately set to work to turn the place into an hotel, which was ready in December 1845. The building was considerably enlarged in 1862 and opened by the new managers, Daniel Peixotto and Charles M. Norcross. Samuel K. Wilson purchased the property in 1866 and held it to his death. His executors sold it to Ogden D. W ilkinson, the present owner, on March 16, 1902. 64 Trenton Times, January 11, 1904. The Fleming Hotel Company was unable to meet the bills incurred in the purchase of the new furniture, so that the Court of Chancery appointed a receiver for the company in 1905. Charles J. Fury bought in the furniture and equipment at the sale, later purchasing the unexpired term of seven years under the lease. Edward J. Mahoney took charge of the hotel for about one year when Mr. Fury, who had been conducting a hotel in Somerville, returned to Trenton to conduct the Sterling. He ran it until 1919. The hotel contains sixty bedrooms and is now under the management of L. L. Hudders. The subscriber has removed from the City Tavern to a house on the East side of the Main [Warren] Street, to be designated the “Trenton House,” - J. M. Bispham. Bispham ran the hotel until May 1, 1829, when he went to New York to take charge of the Clinton House. He let the Trenton House to H. G. Herbert, who ran it for about three years, Joseph Thomas taking it in 1832. The latter was in possession when the hotel was sold at public vendue by John E. Bispham, the administrator of Joseph Bispham’s estate, in 1830. He said he stopped at fifty such, some not quite so good and some better than the one he chooses to describe, namely, Bispham’s at Trenton, New Jersey. We were received by the landlord with perfect civility, but without the slightest shade of obsequiousness. The deportment of the innkeeper was manly, courteous, and even kind; but there was that in his air which sufficiently proved that both parties were expected to manifest the same qualities. We were asked if we all formed one party, or whether the gentlemen who alighted from stage number one wished to be by themselves. We were shown into a neat well-furnished little parlour, where our supper made its appearance in the course of twenty minutes. The table contained many little delicacies, such as game, oysters, and choice fish, and several things were named to us at hand if needed. The tea was excellent, the coffee as usual indifferent enough. The papers of New York and Philadelphia were brought at our request, and we sat with our two candles before a cheerful fire reading them as long as we pleased. Our bed-chambers were spacious, well-furnished, and as neat as possible; the beds as good as one usually finds them out of France. Now for these accommodations, which were just as good with one solitary exception (sanitary) as you would meet in the better order of English provincial inns, and much better in the quality and abundance of the food, we paid the sum of 4s. 6d. each. There is considerable uncertainty as to the exact date of the building of the original Trenton House, but prior to 1794 William Churchill Houston was the owner of the land and the building thereon. His executors on March 13 of that year conveyed the property to Thomas Yardley. The lot was 62 by 234 feet and lay between Job Moore’s lot on the south and an alley which ran eastward from King to Queen Street. The building on thus lot was two stories high, built of brick, 42 feet front (running to the alley) by 32 feet in depth and contained twelve rooms. The alley referred to was laid out in 1736 by William Morris. On March 31 of that year he purchased from Joseph Green twelve feet of land on King Street, running back to the rear of his own lots on Greene Street, for the purpose of laying out a public alley. At various times afterwards it has been known as Morris’, Paxton’s, Pinkerton’s and Yardley’s Alley after the several owners who had acquired lots on its several corners. In 1837 it was widened and laid out as it now appears, and named Hanover Street. From 1804 to 1814 George Abbott was the owner of the building and in it conducted a dry-goods store. Adjoining the store on the south was a two-story frame storehouse 15 by 32 feet, and on the rear of the lot was the coach house and stabling for twelve horses. Samuel Evans owned and lived in the house in 1813. Colonel William Snowden leased the hotel property about 1834 and ran it until his death on September 21, 1846. His widow Maria, as his executrix, conducted it for a few years after his death, with Peter Katzenbach as her manager. He became lessee of the hotel in 1851, and the owner of it in 1854. At that time the hotel consisted of only twelve rooms. During his ownership many improvements were made to the old house. In 1854 he raised it to four stories and added the large dining-room on the Hanover Street side. This enlarged the hotel to fifty rooms; seventy-five more were added in 1869. Room 100 on the second floor was a famous meeting place for politicians in the latter quarter of the past century, and many political deals (and some not political) were made there. Room 100 was permanently engaged by the late General William J. Sewell, and the proprietor was well pleased with the yearly rent paid him, although the room remained unoccupied the greater part of the year. It is alleged that much money exchanged hands in room 100 in those days, and that more than one legislator returned to his home and paid off the mortgage. Secretary of State Henry C. Kelsey and Henry “Staff” Little, both deceased, occupied rooms on the second floor of the Trenton House for thirty-five years. Many famous men have been guests at the Trenton House, especially during Peter Katzenbach’s proprietorship. Abraham Lincoln was given a reception by the citizens of Trenton and dined there on February 21, 1861, while on his way to Washington to be inaugurated President of the Unted States. Peter Katzenbach died January 14, 1906. About 1895 he had made extensive improvements in the rear of the building on Hanover Street, laying it out first as a spacious, modern billiard room with bedrooms overhead, the billiard room later being converted into a grill room, banquet hall and barroom. Frederick F. Katzenbach, a son of Peter Katzenbach, continued to run the hotel for about ten years after his father’s death. The Trenton House Company acquired the property from the estate of Peter Katzenbach in April 1906. This hotel stands on South Clinton Avenue, opposite the Pennsylvania Railroad Station and immediately south of the Mercer Cemetery. Ground was broken for its erection by the late Richard Barlow in May 1893, and it was opened for guests on the Saturday preceding Christmas Day of the same year. After Richard Barlow’s death his son, George H. Barlow, a member of the present Board of Freeholders, conducted the hotel until October 1, 1920, when it was taken over by its present owner and manager, Joseph G. Buch. He immediately refurnished and renovated the place, turning it into a comfortable, up-to-date hostelry. It contains fifty rooms. The lobby, office, dining-rooms and kitchen are on the ground floor. On the same floor on the north side was the barroom, now unoccupied, which was one of the largest and best equipped barrooms in the city during Mr. Barlow’s ownership. The hotel stands on the corner of State Street and Chancery Lane, fronting 67 feet on State Street and running back to Front Street, The first two floors of the building were erected in 1921. The first floor is used for soda and lunch-rooms and also for a lobby-lounge for patrons of the restaurant. Eight additional stories are to be erected in 1929 and will contain 216 guest rooms with bath. In the rear of the first floor is an automobile garage, and above it is a junior ball room and a large banquet room, seating five hundred guests. The total cost of the building is approximately a million and a half dollars. It is under the management of Charles F. Hildebrecht, who has been associated with the restaurant business in Trenton for the past thirty years, succeeding his father, who conducted a restaurant here for ten years previous. The Manze Hotel is a four-story brick .building containing thirty-six sleeping and six bath rooms. It stands on South Clinton Avenue opposite the Pennsylvania Railroad Station. In pre-prohibition days it had one of the finest barrooms in the city, A wide hallway on the north side of the barroom leads to a large dining-room, capable of seating upwards of one hundred and twenty-five guests. The hotel was erected and opened by Frank Manze in 1907. It was operated by his son John until his death in 1917, and afterwards by another son Joseph until 1924. Since it passed out of the Manze family it has had a rather checkered career and at the present time is closed. Several taverns deserve passing mention. The New Jersey Dragoon stood on the corner of Warren and Union (Bank) Streets in 1798. It was called the Union Inn when kept by John C. Hummell and later by his widow in 1803. Sorrel Horse Tavern was located on the southeast corner of Broad and State Streets and was kept by Henry Drake (1799). In 1831 Thomas Combs was in charge of the tavern and five years later we find Asher Temple at the spot. On the southwest corner of Broad and State Streets stood the Washington Hotel, kept by Gabriel Allen in 1827 and by Joseph English from 1832 to 1834. There was, also, the Sign of the Buck, on the northeast corner of Broad and Ferry Streets. John Sully owned it in 1824 and in 1834 we find Patrick Carrigan taking out a license to run the place. Finally we note the Franklin House, situated on the northeast corner of Warren and Hanover Streets. Charles Weber ran it in 1868. The tavern stood on a 100-foot-deep lot, facing 33 feet on Warren Street. There were, of worse, many other places in the city which carried the name of “hotel,” but for the greater part they hold no especial interest for us. In almost every case they were wine-shops or saloons where whiskey and beer were served and consumed on the premises. Few of these establishments had a restaurant or sleeping quarters attached, and therefore need not be mentioned .in connection with the inns and taverns discussed above. THE fair and the market, institutions transplanted here by those who came from England and the Continent, appeared on the American scene at an early date. By the end of the eighteenth century they were quite common throughout the Colonies along the north and middle Atlantic coast. In England fairs were looked upon as privileged markets, maintained under a franchise granted by the Crown. There, as well as over here, they were held at stated times and places, for the sale of either goods of a special sort or of a general character. All and all Manner of Horses, Mares, Colts, Cows, Calves, Steers, Hogs, Sheep and all other Cattle, Goods, Wares, and Merchandizes whatsoever. Which said Fair will be held and kept the same Day above mentioned, and two Days next following pursuant to a Clause in a Charter of Privileges lately granted to the said Burrough Town for that Purpose. An Act of the Legislature, passed in 1797, abolished all fairs throughout the State and thus put a definite end to the possibility of the 1750 fair ever being revived. The selling fair of the eighteenth century was, as far as New Jersey was concerned, a thing of the past. 65 See also New Jersey Archives, Vol, XXIV, p. 330. 66 Confusion is caused by the changing of the names of streets from time to time during the early and middle period. Thus Second Street (today State Street) was apparently known also at one time as Market Street. Warren Street was formerly King.Street, and Broad Street was Queen Street and subsequently Greene Street. 67 New Jersey Archives, Vol. XXVIII, p. 46. There is, too, the advertisement of Thomas Smith in the Pennsylvania Gazette of March 30, 1774, announcing for sale his frame house and lot on the east side of King Street “near the Market-house, adjoining the house of William Clayton, Esq., on the south, and the lot of William Morris, Esq., on the north.” This would seem to indicate that the market-house was on Market Street, for had it stood in King Street, the advertisement would have read “at the market‑house.” This, however, is only speculation. The only location of the market-house which will square with this description is the site on King Street, north of the intersection with Market. It must be noted, however, that it is stretching the point to describe a lot at least 60 feet away from this site as being “at the southeast corner of the market-house.” Can it be that the description is wrong and that “southeast” should read “southwest,” thus continuing the market-house site in State Street? The historian, Stryker, makes no mention of a market standing in King Street during the period of the Revolution. He does, however, mention a small market between King and Queen Streets, on the north side of what is now Front Street, and just off the line of the street. In 1780, when a large body of troops was encamped on the town common, there was an informal market there which attracted the custom of the neighborhood. The common is described in a letter sent from the camp, as being “below the town.” 68 The market was held in the open air and after the troops departed, the market was discontinued. 68 New Jersey Archives, 2nd Ser., Vol. IV, p. 596. The market-house of which Raum makes mention must have been built in the interval between the 1772 fire and the date of its removal late in 1792. Raum describes it as standing in King Street, commencing at Second (State) in front of Abraham Hunt’s store, and extending north up the middle of the street for about sixty feet. At its southern end, he writes, stood the old town pump, and nearby, the whipping post and pillory. Before the incorporation of Trenton in 1792, the market was under the supervision of the town magistrates and the overseers of the poor. They rented out the stalls. An entry in the Town-Book under date of March 1785 makes mention of one James Chapman, who agreed to pay 30s. per year for one of the stalls. When Trenton was incorporated, the Act of incorporation (November 13, 7792) gave Common Council the power to appoint a clerk of the market and to administer the affairs of the market-house. One of the first official acts of the newly constituted Council was to appoint Charles Axford, an assistant on the Council, to sell the market-house, which had finally outlived its worth. The minutes of the Council meeting of December 29, 1792, mention that Axford reported that “he had sold the same at publick vendue for five pounds one shilling and ten pence half penny to James B. Machett, and that it was removed agreeably to ordinance.” At a meeting held on January 19 following, Messrs. Abraham G. Claypoole, Charles Axford and Alexander Chambers were appointed a committee to report at the next meeting on a site or sites for a market-house, the terms on which such site might be purchased, the plan of the buildings and their probable cost. On July 19, 1793, it was agreed that the market-house be built “in the middle of Second Street, between King and Queen Streets . . leaving a square from King Street to the Market House of fifty eight feet.” The committe on construction consisted of Aaron Howell, Charles Axford and James B. Machett, and £200 was appropriated towards the project. The market-house was erected in the fall of that year. At the time that the Council was deciding on the Second Street site, many of the citizens manifested a great deal of opposition to the location. In October, while the market-house was in process of construction, unknown persons pulled down the brick pillars. Prosecution was threatened, but the culprits went unapprehended. Common Council ordered new and stauncher pillars to be erected, two citizens were appointed as watchmen, and the construction went on to completion. Later a market-house of similar size was built to the east of this building, in the middle of State Street, as appears from a reference to the “old” and the “new” market-houses in the market ordinance of 1842. On one of these structures was a cupola with a bell that announced the opening of the market for business. The market-houses were separated by a narrow space; the one nearest King Street was used as a meat market, and the other for a produce market, as indicated by a provision in the 1842 ordinance which forbade the renting of a stall in the eastern market to a butcher or vendor of meats unless all the stalls in the western market should have previously been rented. By the same ordinance, the space between the market-houses, as well as the open squares between the western market-house and King Street, and the eastern market-house and Queen Street, were to be used as stands for truck people “for the sale of watermelons, muskmelons, nutmegs, peaches, sweet potatoes, pickles, and green corn, at the discretion of the committee.” The sale of fish was limited to the eastern end of the eastern market-house and the space between this market and Queen Street. There were 32 stalls in these market-houses, renting at 20s. each under the 1799 ordinance and at $12 to $16 each under the 1842 ordinance per year. Stalls 17-22 remained free for the accommodation of farmers attending the market, who could not find space in the open areas mentioned above. The clerk attended the market every April 1 to rent stalls “to such persons as might first apply to him for that purpose”; each stall keeper had to display his name in large letters above his stall. So narrow was the space between the market-houses and the sidewalks that no wagons were allowed to stand there. Under the 1799 ordinance, they had to be kept in the open areas at the ends of the market-houses. An 1807 ordinance closed the market area on Second Street to the passage of wagons, two chains being stretched across the thoroughfare at Queen and King Streets. By the 1842 ordinance, wagons coming to market were allowed ten minutes for unloading, no vehicles could stand in the market limits, and wagons passing through had to keep to the right side of the street. The clerk of the market was appointed by the Common Council. It was his duty to attend the market on market days, to enforce the rules of the market; he was to keep the market clean, prevent unwholesome provisions from being sold, attend the public scales, and settle all disputes regarding weights and measures. His was the duty, then, of preserving the reputation and cleanliness of the market. Under the 1799 ordinance, every Tuesday, Thursday and Saturday, from April to September, and every Wednesday and Saturday during the rest of the year, were market days. Later, Tuesday, Thursday and Saturday were the market days during the whole year. The market began at dawn and lasted until 9 a.m. from April 1 to October 1, and until 10 a.m. the rest of the year. The bounds of the market were Second Street between what is now Broad and Warren Streets, and any person found selling provisions within fifty yards of these limits during market hours was subject to a fine. The ordinances of March 2, 1799, and February 21, 1842, concerning the market and the duties of the clerk of the market, were framed to preserve the reputation of the market. Standard weights and measures were to he used, steelyards were prohibited, the purchase and resale of goods at a higher price within market limits was punished by a fine. No person might hold more than two stalls, goods brought to market were to be unloaded and unpacked before sale, passages in the market-houses were to be kept clear, and the clerk was to scrape the market thoroughly at regular intervals. The market served not only as a place for the sale of food and domestic products, but it was also a stand for itinerant preachers, lecturers and medicine men. The Sheet Anchor of Democracy (May 16, 1843), under the heading, “Varieties in Trenton,” says: “For two or three nights last week the Market House was crowded with attentive listeners, first to an eccentric preacher on some doctrine of his own, and afterwards to a melodramatist, who recited Shakespeare with a stentorian voice.” These lectures and entertainments took place, of course, after market hours. The early decades of the nineteenth century witnessed the erection of a market-house on old Mill Hill, in the middle of what is now Market Street, facing Broad. Who built it, and in what year, is unknown. It had five stalls, ranged three on the north side and two on the south. Due to the competition of the Second Street market above the creek, and because of the few people who lived in the neighborhood, the Mill Hill market had only a brief existence. In 1837 the lower story was boarded up and used as an engine house by the Eagle Fire Company. The upper story, supported by eight brick columns rising twelve feet above the ground, had been used as a school, known as the Mill Hill Academy. The school-room was reached by a box stairway at the southeast corner of the building. The instruction given was of a primary sort, the Mill Hill children being obliged to go to the Trenton Academy for more advanced learning. In 1837 this school-room became the meeting place of the members of the Eagle Fire Company. The structure was surmounted by a steeple whose bell used to summon the children to school. In the ‘40’s, further use of the building for any purpose became dangerous due to a decay of the timbers, and so, shortly after Mill Hill had incorporated with South Trenton, the old market-house was demolished. This same period witnessed the erection of a market-house in Bloomsbury, on the northwest corner of what is now Warren and Bridge Streets. The structure was longer and narrower than the Mill Hill market-house, and contained seven stalls, housed in a frame building which occupied the entire west side of the street and extended out beyond the curb line in Warren Street. There was a footpath extending the length of the market, - it was a narrow affair between the west wall of the building and a fence, and allowed for the passage of a single person only. In connection with the markets of this time it is interesting to note that at a meeting of Common Council held on December 27, 1806, a committee was appointed to draft a bill authorizing “the procuring of sealed weights and measures for the use of the city.” These sealed weights and measures were in the charge of the clerk of the market. On February 9, 1838, an ordinance was passed providing that all weights and measures thereafter used in Trenton were to correspond with the standards used in Pennsylvania. The clerk of the market was authorized to inspect annually all the measuring and weighing devices used in the city, and to collect fines of those persons found violating the ordinance. At this period the right to maintain the city hay scales was rented out by the Council. Thus, on January 25, 1806, Common Council accepted the proposal of Isaac Barnes, Jr., to erect and maintain the city hay scales. In 1836, the city ordinances mention Barnes as the one in whom the exclusive right of maintaining such scales was lodged. He paid the city $60 annually for the privilege. In 1848 Lafayette Stradling held the privilege. By 1845 the markets in State Street had outgrown their usefulness; on March 15 of that year we find an ordinance authorizing the erection of a new market-house, to be not more than 20, nor less than 18, feet wide, nor less than 250 feet long. The market was to .be built in the middle of Broad (then Greene) Street, beginning on the line of intersection with Second Street and continuing northward, toward Academy Street. Recalling the difficulties encountered with the narrow passages on either side of the market-houses in Second .Street, the Council provided that the western row of supporting pillars was to be placed not less than 32 1/2 feet from the front of the houses on the western side of Greene Street. Messrs. Hunt and Anderson were to be the contractors for the new market-houses. It was also determined to widen Greene Street by 15 feet on the east side to a width of 80 feet, and an ordinance of June 12, 1845, authorized the issue of proposals for a loan of $1600, “the amount of damages awarded by the commissioners for widening Greene Street.” At the same time, a loan of $3750 was authorized for paying for the erection of the market-houses. The Greene Street site was not chosen without a show of opposition by property owners along Second Street. Joseph Wood, Joseph C. Potts and John A. Weart were especially active in seeking to have the market brought west of Warren Street, on Second. Their proposition was that the city build the market in the middle of Second Street, between Warren and the west line of the government lot - a distance of 350 feet. Weart pledged himself to give a 15-foot strip for this entire distance on the north side of Second Street, that the street might meet the demands of the Council for an 80-foot width. Potts collected promissory notes of property owners in the vicinity, to the amount of $3150, which were to be placed in the hands of the mayor should the proposed site on Second Street be chosen. A special election for the choosing of the market site was called for May 22, 1845. The Greene Street site received a majority of the votes cast, and the contractors immediately proceeded with the building of the market-houses. The market was completed by late fall. Market days were Tuesday and Thursday, from dawn to 1 p.m., and Saturday, from dawn to 2 p.m. and from 6 to 9 p.m. The bounds of the market were Greene Street, between Second and Academy, and no person was allowed to sell goods outside of market limits during market hours, under penalty of a fine. The market ordinance of September 18, 1845, laid especial stress on measures which would insure the cleanliness and good name of the market As before, the clerk of the market was in general charge and was responsible for its cleanliness, the honesty of transactions, the quality of the goods offered and the general order of the market. There were two markets in Greene Street, the lower, near Second Street, and the upper market to the north of it. The markets soon proved inadequate for the volume of business transacted. On August 21, 1848, Common Council authorized an addition to the upper market, to be 130 feet long (thus almost doubling its size) and built along the same lines as the market-houses already standing. Various supplements to the 1848 market ordinance were passed in subsequent years. One extended the market hours to 2 p.m; another limited the sale of fish to the north end of the lower market and between this market and Hanover Street; still others forbade smoking in the market during market hours, or the defacing of the market property in any way. Yet another forbade the sale of fresh meat anywhere within the city limits except at the market, an exception being made in favor of those butchers who rented a stall at the market and also owned a store. They could sell meat before or after market hours. Only wheelbarrows were allowed in the market limits; wagons could enter only to unload or pass through. Toward the close of the ‘6o’s, property owners along Greene Street began to object to the presence of the markets, claiming that they lessened the value of their properties. Accordingly, Common Council voted to relinquish the city’s right over the markets, and in the spring of 1870 they were torn down and the material sold for $800. The Greene Street market was the last of the city-owned markets. Private enterprise, noting the benefits that might be derived from having a market in the lower wards of the city, sought permission to carry out such a project. On March 23, 1854, an ordinance empowered John Whittaker “and such other persons as may associate with him” to erect a market-house in Market Street between Broad and Jackson, which was to be built on the same general plan as the Greene Street market. These associates were given the franchise of holding the market and taking fees, subject to the city’s right to take over the market upon paying them its original cost. Market limits and market hours were established, and an agent of the associates was authorized to attend the market as clerk and complain to the mayor when the ordinance was violated. No person was allowed to sell goods intended for the market in any street of the Third Ward north of Bridge Street on market days. This market, like the uptown markets, eventually yielded to pressure of public opinion and was removed, following the sale of the sheds on May 11, 1874. On April 1, 1870, John Taylor, who had been prominently associated with the movement to abandon the street markets, erected a permanent market inside the house-line on the east side of Greene Street, just south of Academy. The building measured 51 by 120 feet and contained 53 stalls and a restaurant. Shortly after this, Samuel K. Wilson and Jacob R. Freese built a market in Chancery Street, near Quarry (now Hanover), on what is now the site of the First Precinct police station. Those who had sought to have the city build its market in Second Street in 1815 had also offered the alternative proposition of opening a street 80 feet wide through the government lot (which Joseph Wood, Joseph C. Potts, John A. Weart and Dr. John McKelway had bought), from Second Street to Potts Alley, and to build markets thereon, to be given to the city should the Council choose to accept their proposition. This alternative offer also fell through when the citizens definitely voted for the Greene Street site. The Chancery Street market - known also as Freese Hall or People’s Market - was 50 by 100 feet, with an extension in the rear of 20 by 120 feet. It contained 119 stalls and a restaurant. On the second floor were a hall, seating about 700 people, a gallery and two anterooms. The hall was used for meetings of secret organizations and for dances. On .December 15, 1869, the company comprising the Washington Market Association was formed. It was incorporated on February 8, 1870, the incorporators being: George Fitzgeorge, Joseph B. Yard, Henry N. Barton, Adam Exton, John Taylor, Casper Martino, Imlah and Charles Moore, Joseph G. Brearley, David Naar, Henry B. Howell, David Manko and John F. Klein. It was the three first-named gentlemen who had originated the idea of the Washington Market enterprise. The market, which was torn down in 1928, stood on the west side of South Broad Street, between Front and Lafayette Streets. The land for the market cost the association $69,000, the building $36,000. The market proper contained 209 stalls and a restaurant, and was surrounded by an inside gallery. The second floor, which was 108 by 135 feet deep, contained a large hall, equipped with a stage and seating 1200 persons, and nine rooms which were rented to various enterprises. It was in this hall that the dances and balls of many local fraternities were held. Company D of the local militia for a long time used it as its drilling quarters. 69 The statue has been preserved by Mr. John W. Schlegel. Just before Washington Market was demolished in 1928, Messrs. Sam Page, John W. Schlegel and Joseph Hollies, all renters of stalls in the market, decided to build a market directly in back of Washington Market, to be known as the New Washington Market. This market was built in 1926 and has a 65-foot frontage on Lafayette Street, between Broad and Warren, and runs through to Front Street. There is room for twelve stalls. Yet another private market was built in Trenton in the ‘70’s - the Central Market, on the northwest corner of Front and Stockton Streets. The building was one story high, and had fifty stalls. After a brief and unprofitable existence, the market became defunct. The Conner Millwork Company occupies the building today. With the passing of the private market, the city-owned market again came into prominence, this time in an entirely different form from the city markets so familiar to the nineteenth century. The city markets of today are farmers’ markets, open-air affairs to which housewives come in the early evening to buy fresh products direct from the farmer. Farmers within a radius of twenty-five miles come to Trenton to take advantege of these markets, thus eliminating the wholesaler and making for a greater profit to the farmer and a saving to the consumer. The original farmers’ market was in Front Street, between Broad and Warren Streets, where most of the wholesale produce dealers had their stands. The street proved too narrow for the quantity of produce brought there for sale, and in 1918 the farmers agitated for a new market site. The City Commission’s cooperation was secured, along with that of the State Department of Agriculture, and a farmers’ market was established on South Broad and Third Streets. Walks and lights were installed and the market placed under the supervision of the sealer of weights and measures, with a market master in charge. The South Broad Street market was originally planned for farmers desiring to sell in wholesale quantities or to retail produce dealers, but because of the increasing demand from the consuming public to buy direct from the farmers at lower prices, the trading gradually drifted into the selling of smaller quantities. Wholesaling was allowed from 4 to 7 p.m. and retailing from 6 to 11 p.m. The farmers who wished to sell on a wholesale basis exclusively did not like this combination market and soon moved back to Front Street. The city then established a wholesale market on city property adjoining the Municipal Wharf; at first this market proved popular with the farmers, but within two years they had drifted away and the market was abandoned. The site, however, came into use again on August 1, 1924, when the retail market on Broad Street, which had proved to be highly successful, was moved down to the Municipal Wharf. The land was graded and two walks laid that would accommodate stands for 125 loads of produce. In 1926, sheds, 140 feet long and 20 feet wide, were built over the walks. The sale of produce by anyone other than the producer is prohibited, an exception being made in favor of reliable hucksters who carry only the freshest of produce the year around. Even then they may not display or sell any product offered by farmers attending the market. The market is under the direct supervision of a market director, who has full charge of all the markets of the city. He rents spaces to the farmers, requires of each one an affidavit to the effect that he has raised at least 90 per cent of the produce he offers for sale, and makes monthly reports on the condition and progress of the market. Branch markets for farmers have been established at three places in the city: in the Tenth Ward, at Roebling Park, the market being a curb market, established September 1, 1924; in the Eighth Ward, at New York Avenue and Pine Street, opened June 15, 1926, after having had an existence of almost a year at a site two blocks away; and at Chestnut and Grand Streets, opened July 20, 1926. Market hours for the sale of produce at retail are from 7 to 11 p.m. every week day. No farmer may occupy more than two stalls. During the period that witnessed the beginning of the private markets in Trenton, the fairs, dormant since the end of the eighteenth century, came back into being. But this time it was not the old-time selling fair, - that had been abolished by statute. The eighteenth century fairs were agricultural fairs, the invention of a prosperous Albany, N.Y., merchant, Elkanah Watson. At these agricultural fairs one might see displays of products of the vegetable, animal and mineral kingdoms, exhibitions of all sorts of live stock, agricultural machinery, manufactured goods, home products and fancy work. There were present the inevitable side-shows and victualling stands, and horse racing was a feature of almost every fair. The first appearance of a fair locally in the last century was the fourth annual fair of the State Agricultural Society, which opened here on September 14, 1858, and lasted three days. The Daily Gazette gave a great deal of space to details of the fair and the awarding of prizes. The fair was held just outside of the city, according to newspapers, but just where they do not say. The probable site was the Eagle Race Course, which was set back quite a distance from South Broad Street and extended almost to what is now Hamilton and Chestnut Streets. Admission to the fair was 25 cents. The State Agricultural Society held its exhibition here in 1858 only. What promised to be a permanent fair organization established itself in Trenton in 1866. The Central Agricultural Society of New Jersey purchased land close to the present site of the Inter-State Fair Grounds, enclosed its one hundred acres, and held its first fair almost at once. This fair of 1866 was an exhibition giving every evidence of the haste which had attended its preparation; it was not until the following year that the fair showed itself to be a planned and finished exhibition. Permanent buildings had been built and a mile race-track laid out. The 1867 fair witnessed one of the finest exhibitions of blooded and race horses that had ever been assembled in the East. The most celebrated stables sent in entries, and $7000 was awarded in prizes. The fair lasted four days and offered the usual displays, entertainment and attractions. The last fair of the Central Agricultural Society was held in 1871. The next year it decided to sell out, one of the purchasers being Henry N. Smith, Jay Gould’s partner, who established the famous Fashion Stud Farm, described fully in Mr. Cleary’s chapter on “Recreations,” below. The Mercer County Board of Agriculture held its first fair on Wednesday, October 7, 1885, and after three years was succeeded by the Inter-State Fair Association, whose activities are also recorded in the same chapter on “Recreations.” It may be added that fire has twice destroyed the grandstand which faces the race-track - in 1900 and again in December 1909 - but both times a larger and stronger structure replaced it. The only other fair ever held in Trenton was the National Horse Fair of 1870. It began on May 24 and lasted four days; $10,000 in prizes was awarded for the performance and quality of the horses.